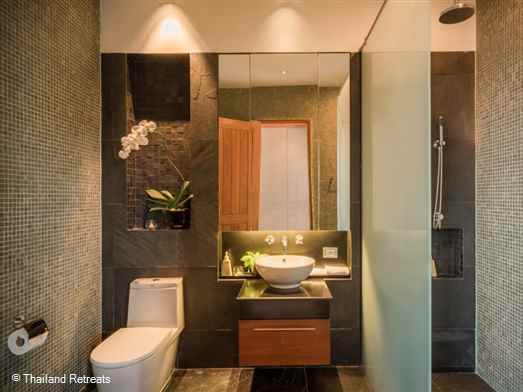 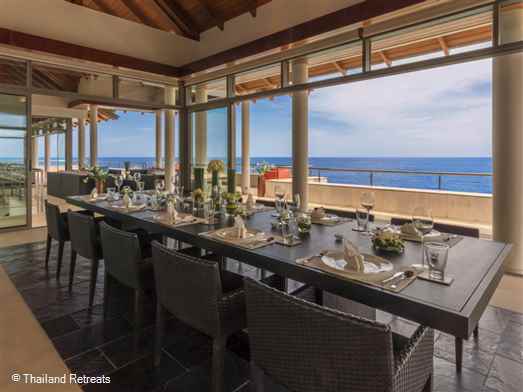 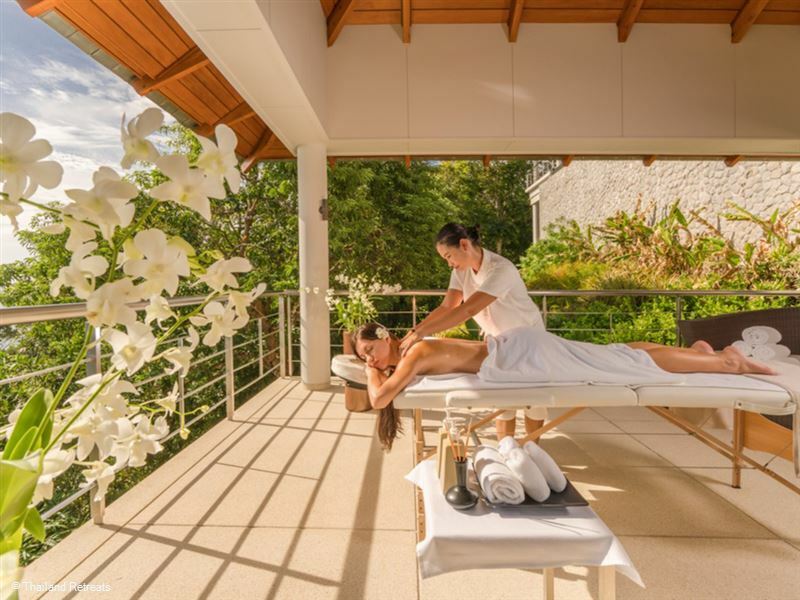 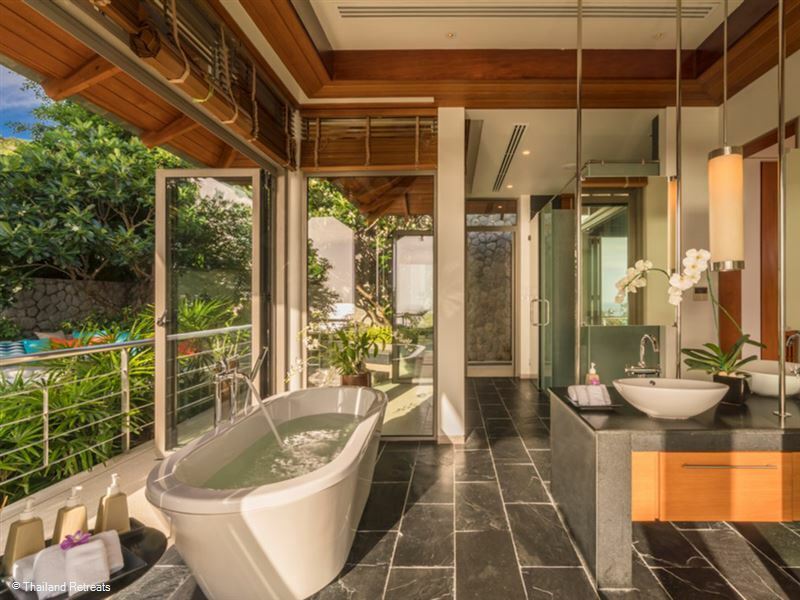 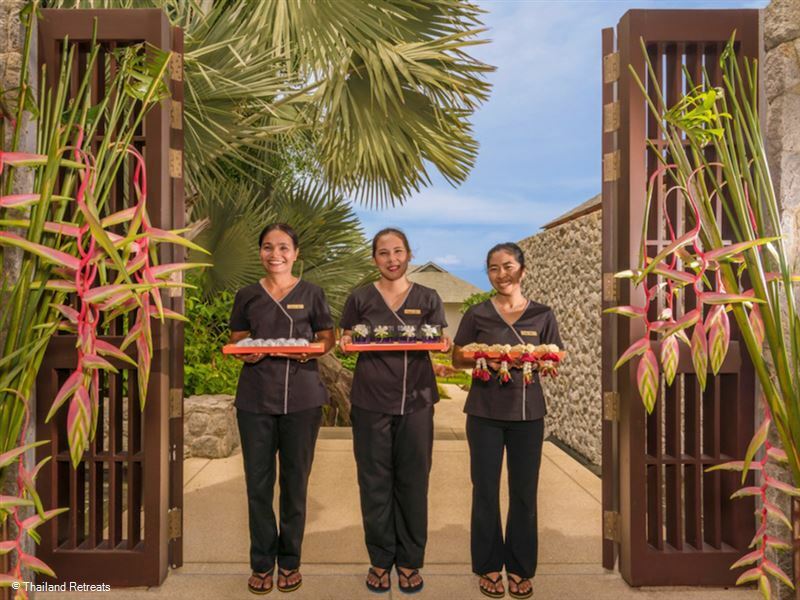 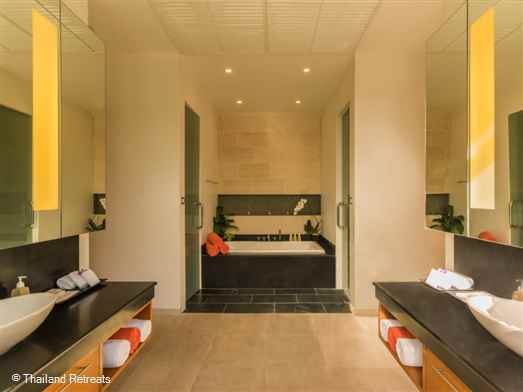 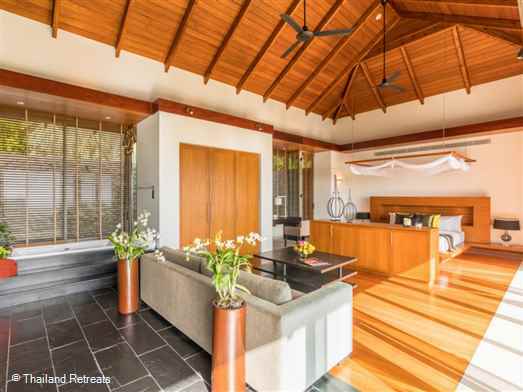 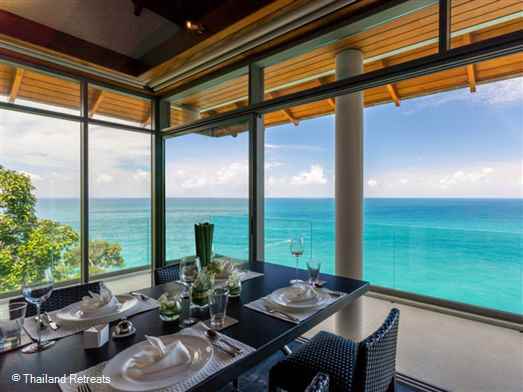 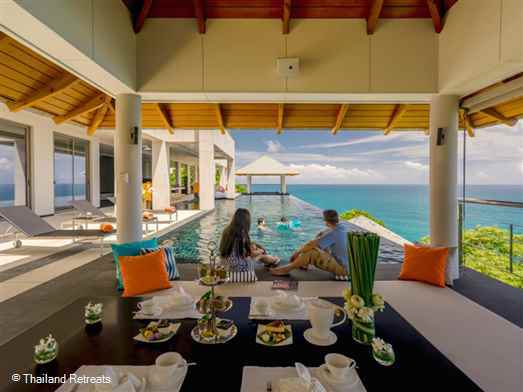 Ban Paa Talay Estate is a sleek an spacious villa with spectacular ocean views and superb facilities. 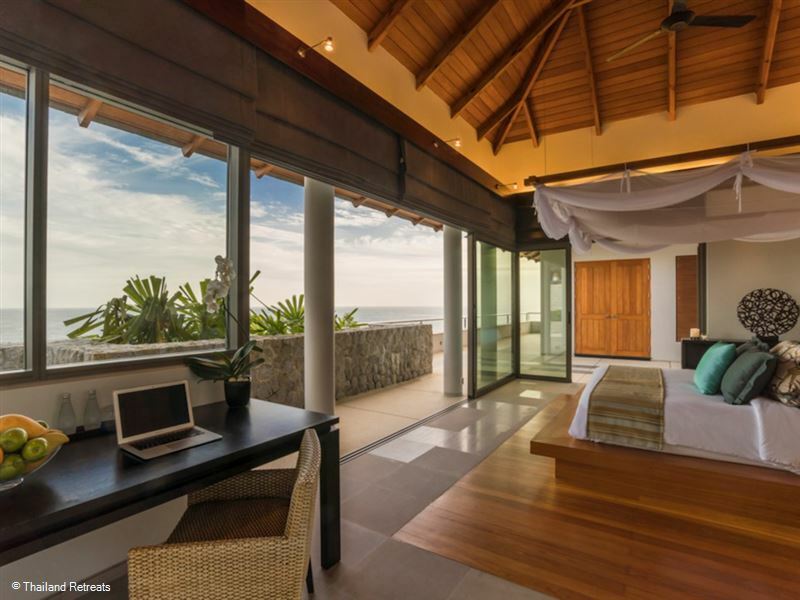 The 4 levels of accommodation include a 2 bedroom ocean villa and a honeymoon hideaway. 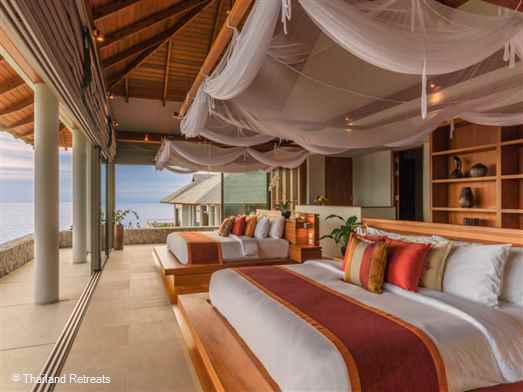 Offers rates for 7 and 9 bedroom use. 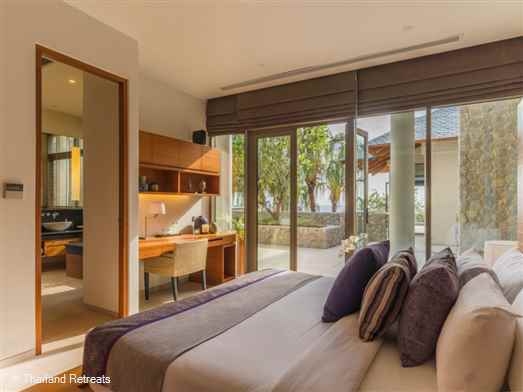 From a grand gated entrance, steps descend to the villa’s upper level comprising an air-conditioned gym and stand-alone guest bedroom plus, on the top floor of a two-storey bedroom pavilion, the first of two master suites. 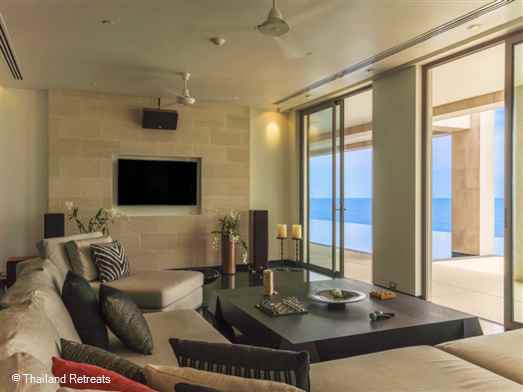 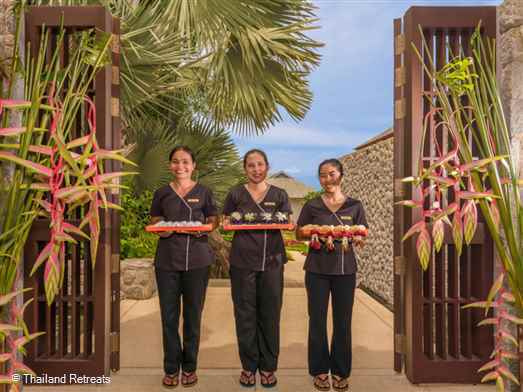 Next, under the gaze of a serene Buddha and arranged around a large water feature punctuated by a majestic frangipani tree, are the guest kitchen, dining room, open-air reception lounge (from where the spectacular ocean panorama is first fully appreciated) an air-conditioned TV lounge and another guest room. 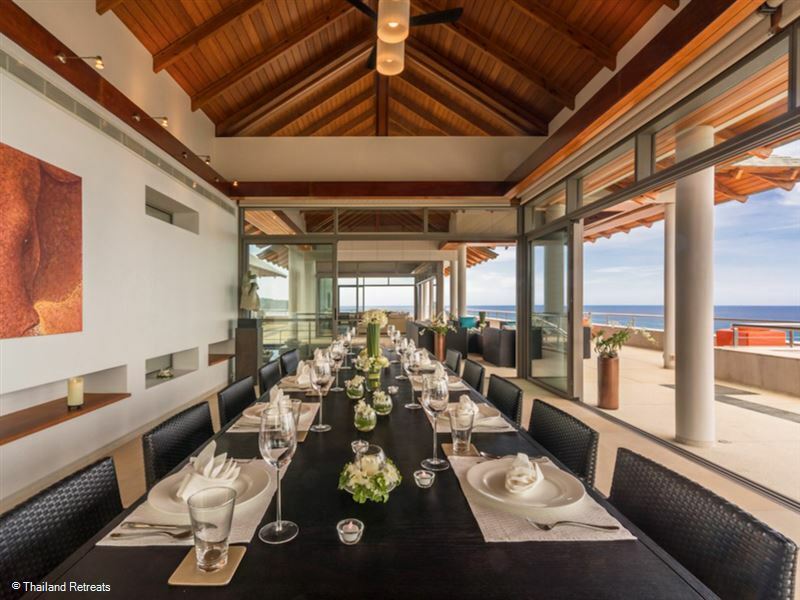 The dining room seating 20, gleaming guest kitchen, relaxed sitting room and open-air reception lounge crown Baan Paa Talee Estate’s living areas. 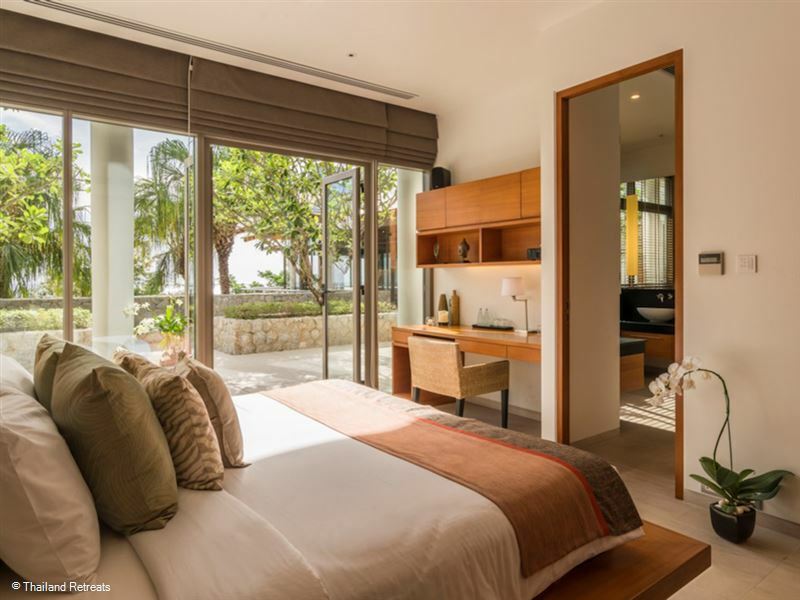 Off to one side of the living areas is the second master suite and – set slightly behind and below the first master, two connecting guest rooms. 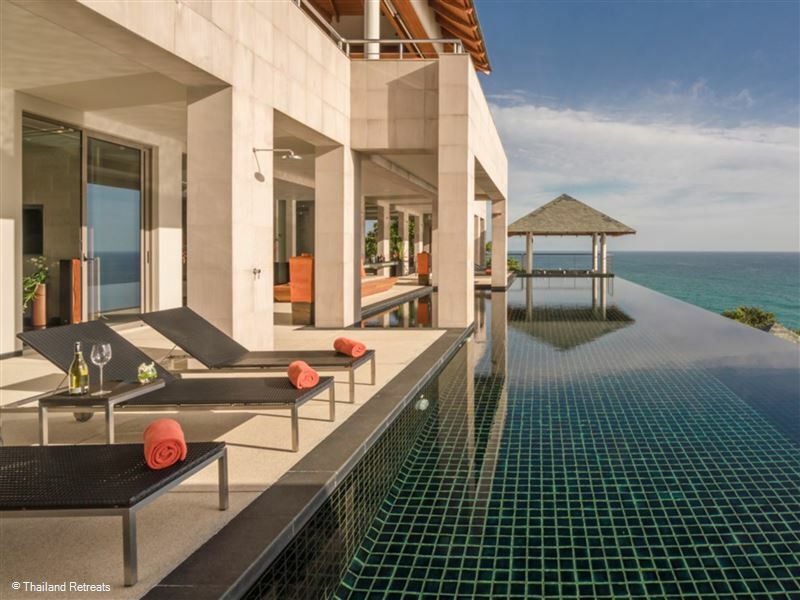 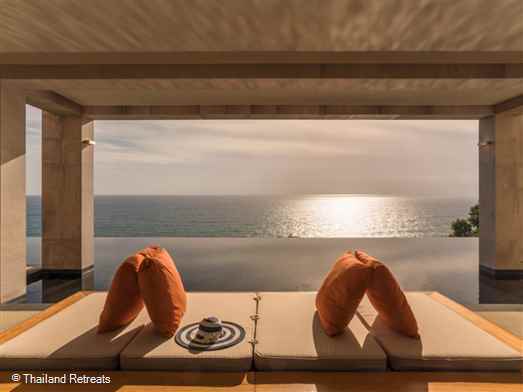 Thenext level down is the villa’s ‘chill out’ zone where a 25-metre infinity pool melts into the ocean, capped at one end by a dining pavilion with sunken seating and at the other by a shaded jacuzzi. Sun loungers flank the pool and a bar, pool table and more comfy seating beckon for relaxed days in the sun. Also on this level is an air-conditioned media room for when it’s time to cool down with a favourite movie and the fifhe guest bedroom and finally, far below the self-contained two-bedroomed Ocean Villa, which lies in perfect privacy closest to the water’s edge. 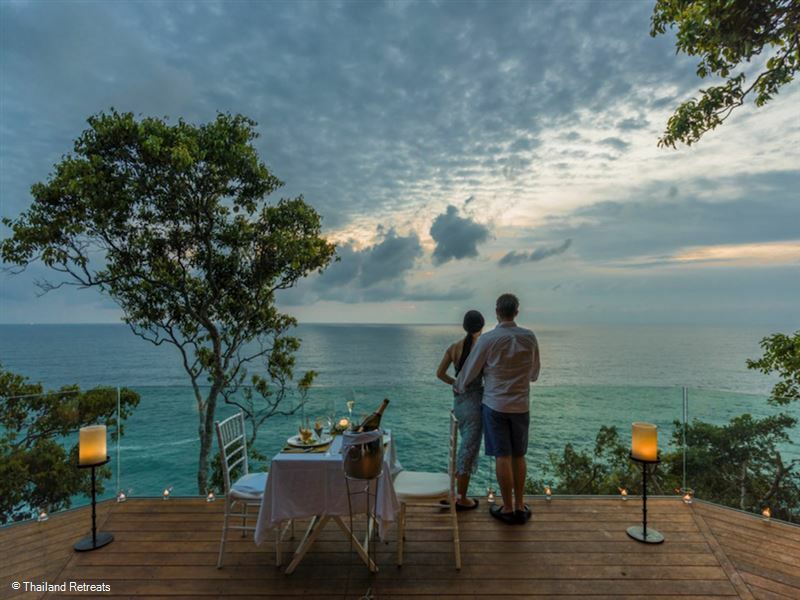 The villa makes a romantic hideaway for honeymooning couples and a magical ‘tree sala’ provides an enchanting setting for wedding vows. 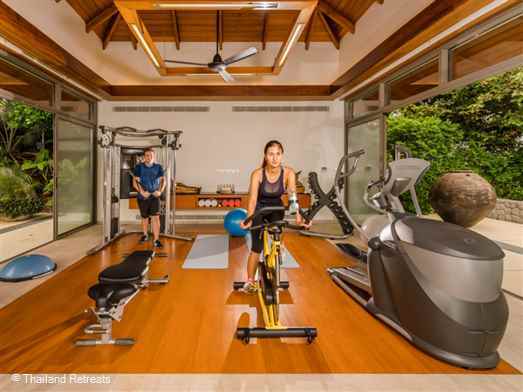 There is also a beach house containing watersport equipment before steps leading down to the water’s edge. 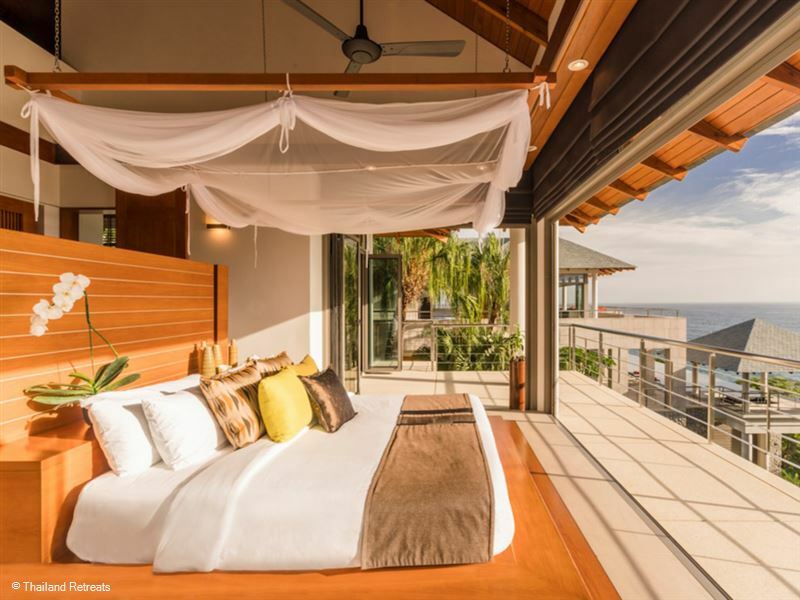 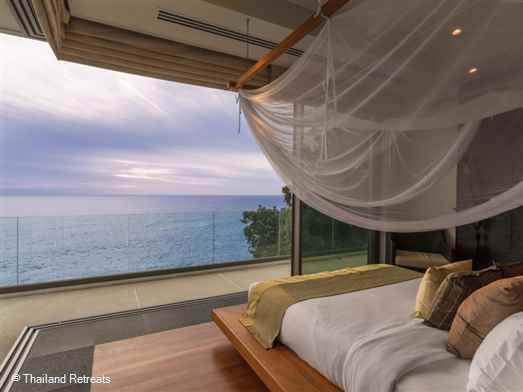 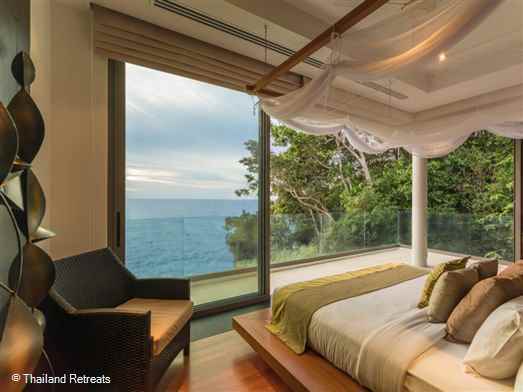 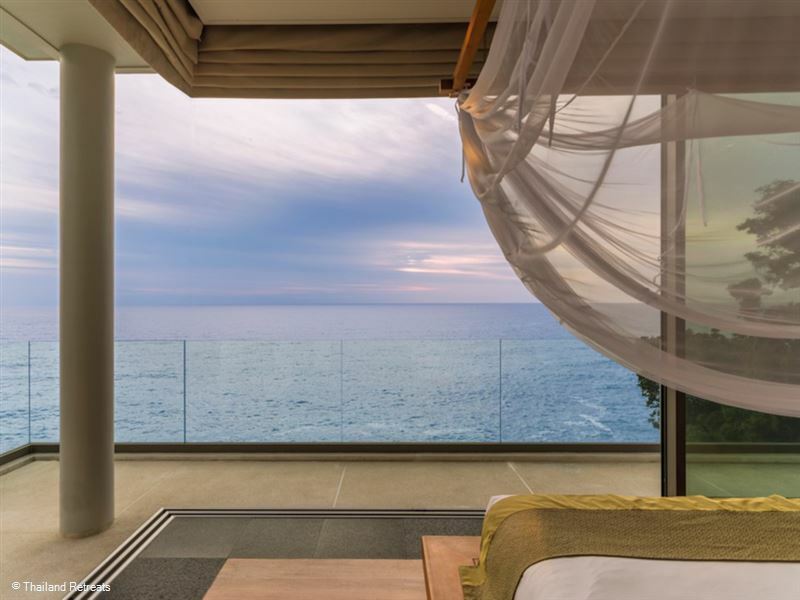 Every bedroom at Baan Paa Talee Estate is furnished with a netted king-size bed looking out over the ocean through walls of floor-to-ceiling glass that can be opened up for a full tropical living experience if desired. 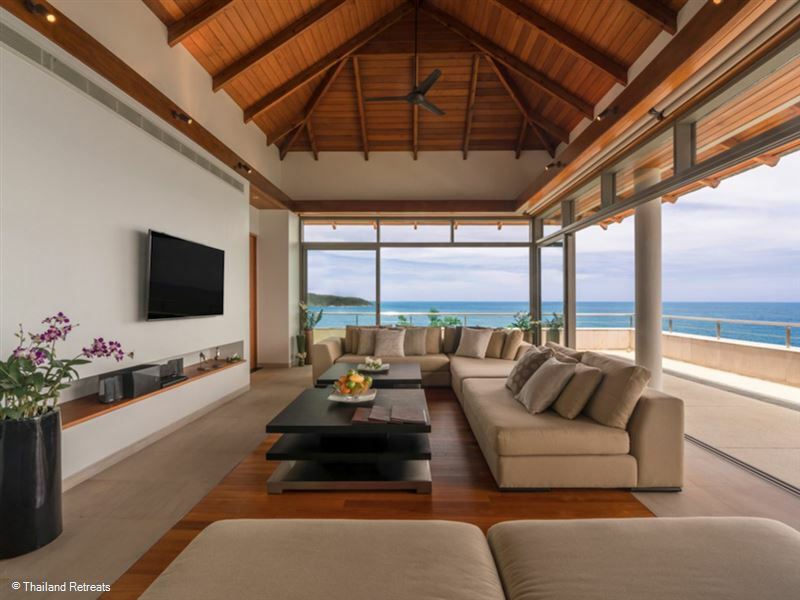 Rooms can be cooled with either air-conditioning or ceiling fans. 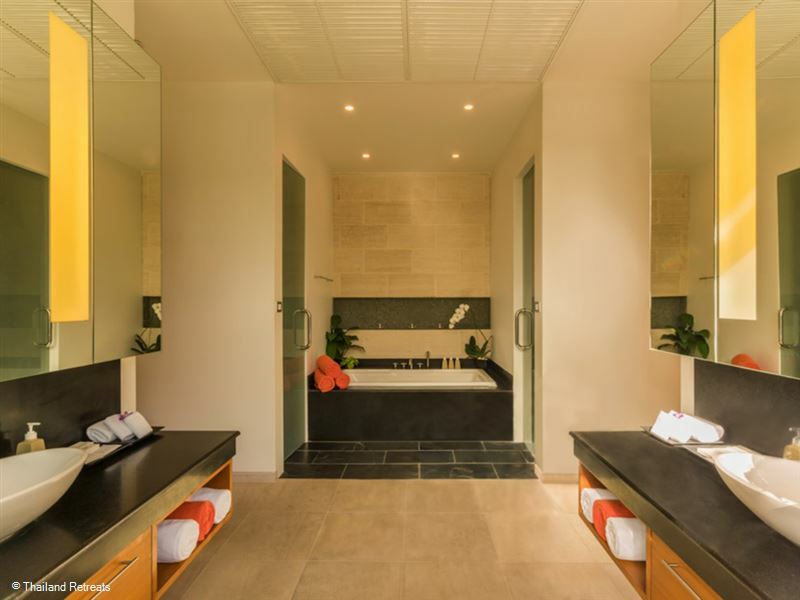 Warm, honey-gold teak features heavily in vaulted ceilings, dressing areas and flooring and every room comes with a safety deposit box and a sound system with Bluetooth connectivity. 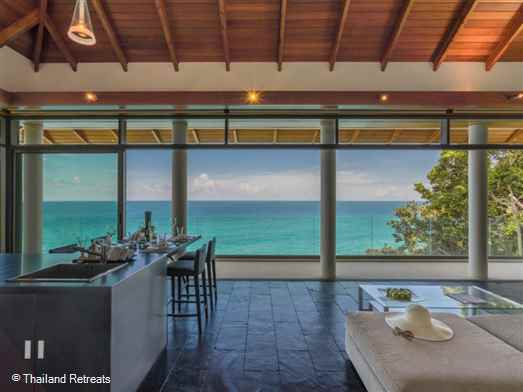 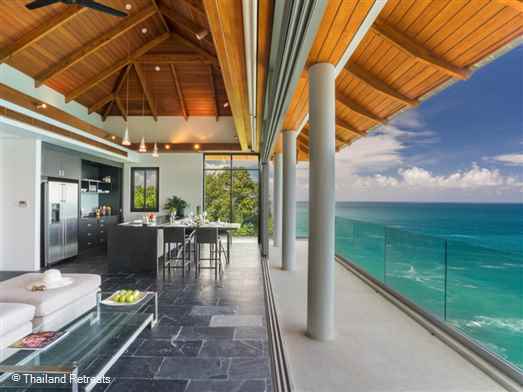 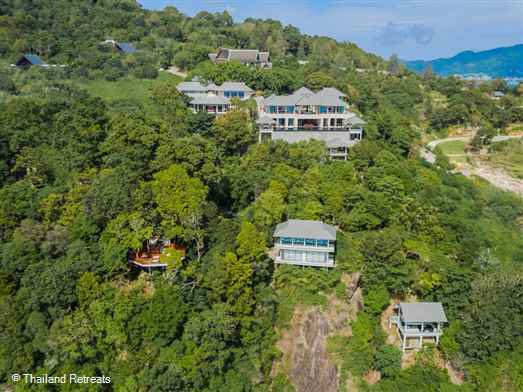 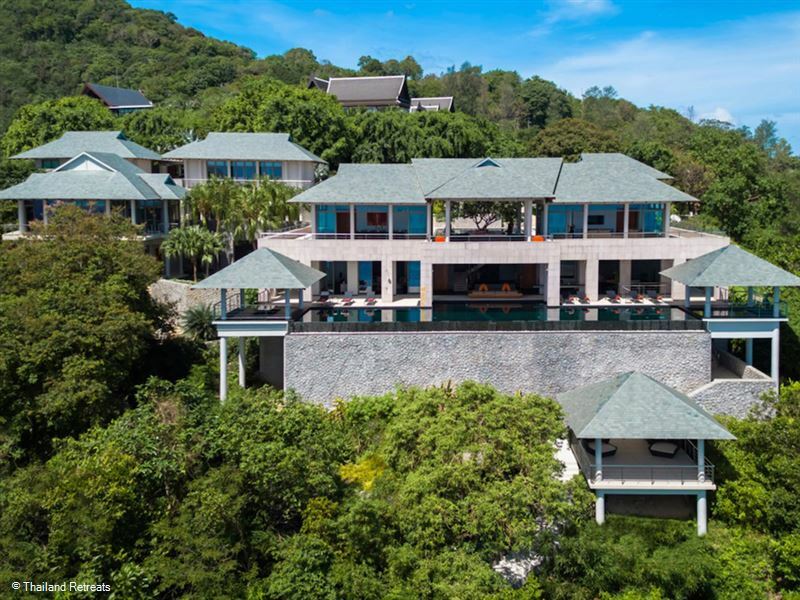 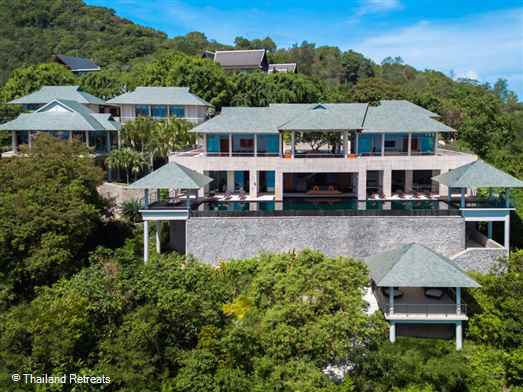 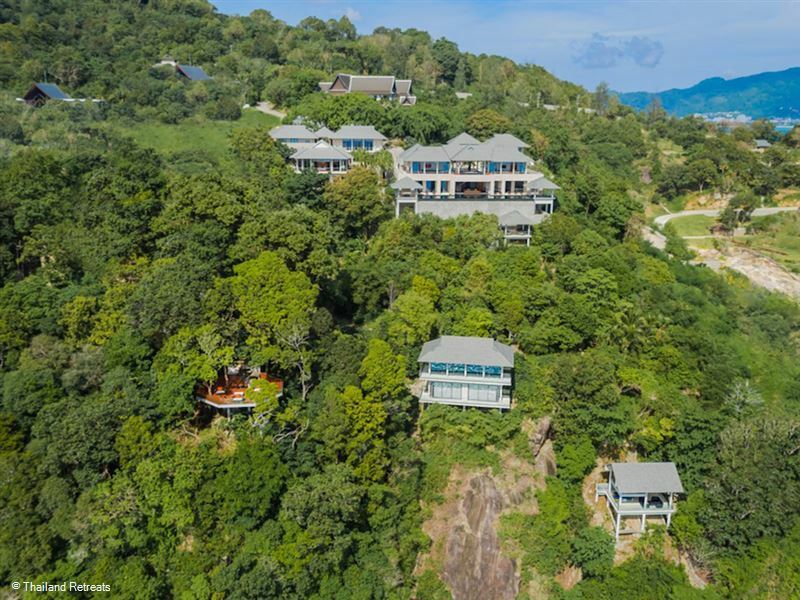 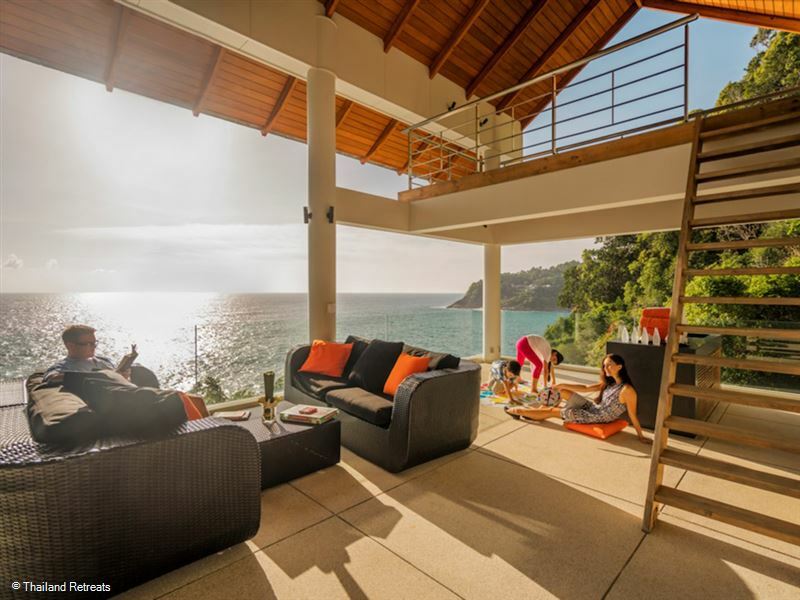 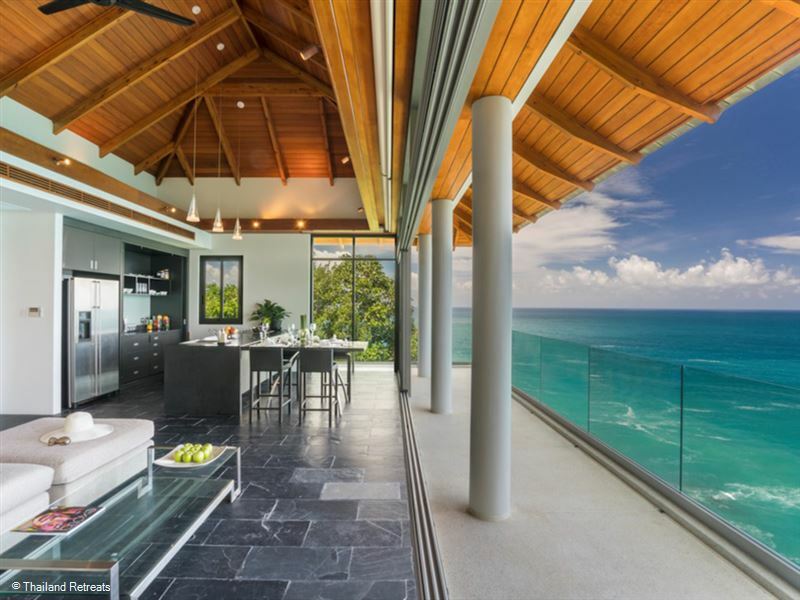 Baan Paa Talee Estate lies just south of Kamala Beach on Phuket’s west coast and is part of the exclusive Cape Amarin private estate, set on a dramatic rocky headland with spectacular views out over the Andaman Sea. Luxury villa developments line this spectacular stretch of coastal road known as Millionaires’ Mile, together with some five-star resorts which are home to upmarket wining and dining establishments such as The Paresa Resort, Cape Sienna’s Vanilla Sky rooftop bar and the popular Silk Restaurant at the Hyatt Regency – all just few kilometres to the north of the villa. Laid-back Kamala’s sandy bay is a 10-minute drive away, while Surin Beach, with a greater range of restaurants and shops, is a further 5-10 minutes to the north. Lively Patong is 15-20 minutes to the south. 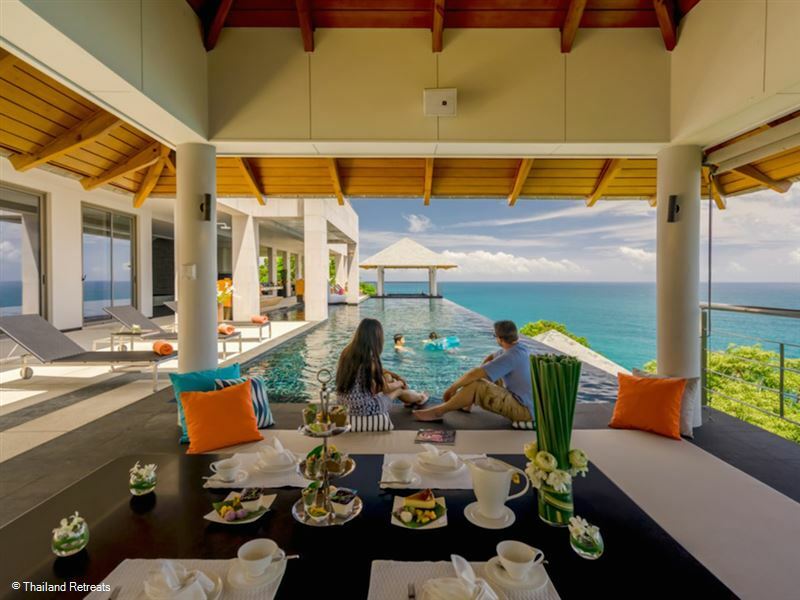 When you are once through the doors of this amazing villa, guests may well find that any ambitions to venture further afield just melt away. Kamala is on the west coast of Phuket, north of Kalim and Patong. 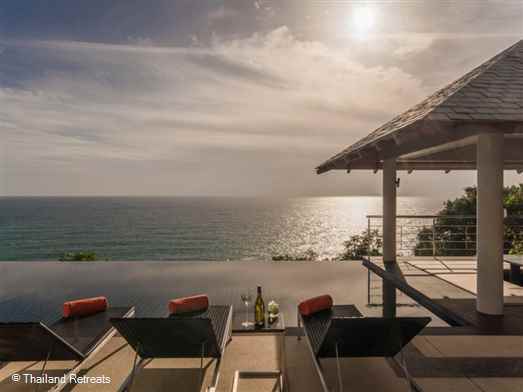 This was a traditional fishing village that remains closer to its routes than Patong. 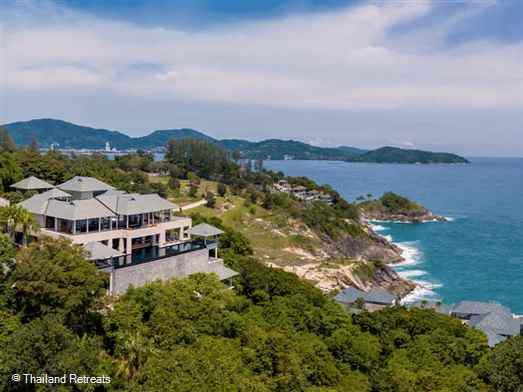 Kamala Beach is an enclosed bay, with calm waters that are suitable for swimming. 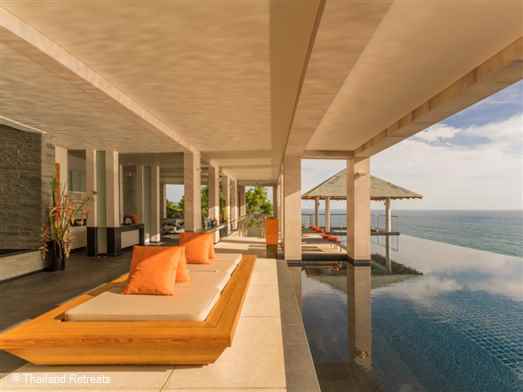 It's a tranquil area and the bay surrounded by tropical hillside where several upscale villas and hotels are located - part of which is known as Millionaires mile.